You might be surprised at how the overall look and feel of your office building can have an effect on your employees and customers. 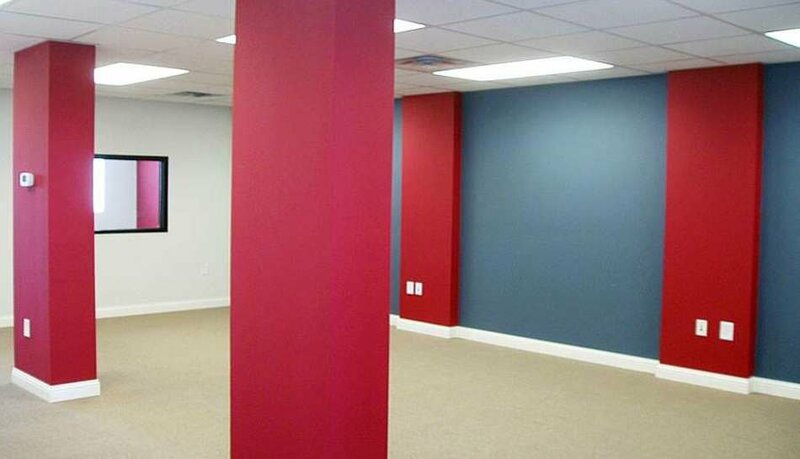 If you’re in need to get your office painted, we are here to help you. We have painted the interiors and exteriors of countless office buildings of all sizes. We can help you achieve a clean, stylish, and productive workplace—all with as little downtime as possible. Analyze the office space and provide a comprehensive plan and detailed proposal of how we would approach the work and carry out our job. Provide you with a free quotation and costing of how much the job would cost. Before the actual work starts, we mask and cover the entire space so that there are no paint stains in unwanted places. Ensure the work gets completed well within the stipulated time without any downtime and delays. Do a thorough cleaning after the paint job is done, to remove the unwanted stains, if there are any. What makes our office painting services stand apart from the rest? -Quick, high-quality workmanship from our experienced team. -Ensuring proper masking and covering of all areas that are exposed to paint. -Minimal downtime for your employees and/or workers. -Interior and exterior painting projects done right the first time. -Free colour consultation and shade sampling. What is the kind of paint I should use for my interiors? There are primarily two kinds of decorative paints for interiors. a)	Oil based paints: These paints are as the name suggests oil based. These come in primarily three types. 2)	Semi gloss: Slight sheen. The sheen level varies from the soft ‘satin finish’ to the semi gloss ‘Lustre finish’ In common parlance, there exists A satin paint and a Lustre paint, both are variants of the semi gloss oil based paint. These are used on walls and wooden surfaces like doors/partitions. 3)	High gloss: The most common type and oldest type of oil paint. It’s super glossy and shiny. This type of paint s used on metal surfaces like grills and railings. 1)	Acrylic distemper: This is the most common and economical paint. It has a matte finish and is available in limited shades. Most new flat owners would get their homes with walls painted in acrylic distempers. It’s economical, quick to dry but is non washable. 2)	Economic emulsions: These are one grade above the distempers in terms of finish. This paint is smoother to touch; looks better on the walls but can’t resist stains and can’t be washed. Tractor Emulsion, Dulux promise and Berger Bison emulsion are some of the examples. 3)	Washable Emulsion: These are paints developed a decade ago and are quick drying and washable at the same time. These paints have a smoother finish than distempers and emulsions and have a paint film which has abrasive resistant compounds. Hence these paints have a soft sheen like oil based ‘satin’ finish. They area available in thousands of shades. Eg: Berger easy clean, Dulux 3 in 1. Once I decide the type of paint I would like, how do I get my home painted? It’s very simple. Just book a free estimate with us and we will visit your property and measure all the paintable surfaces that you would want to paint and based on your product choice will draw you an estimate and email it to you. How will you measure the home? How accurate are your estimates and measurements? Very accurate. Measurements are usually conducted in the presence of you or your representative. We do make it clear in our estimate that the measurements may vary by 5% to 10% based on new surfaces that may come up for painting (a newly installed partition/ door/ wall. Bills are drawn based on the estimated measurements and if in case there is a variation in the scope of work, then we also do post measurements after the job is complete. How do you provide your estimates? We provide our estimates based on the area that is to be painted. We quote a per square foot or square meter rate and measure different areas separately where different kinds of paints are used. Eg: you may choose to paint the walls with a luxury emulsion, the ceilings with economy emulsion and doors with oil paint. Our estimate will segregate the different items and quote you different rates and derive at the total cost for painting. I have a set budget for painting. Can you do the job based on the budget on a lumpsum basis? Everyone has a budget allocated for home improvement work. However we don’t quote on lumpsum basis unless it is a very small job or a job which is difficult to measure. : eg: engraved jalli work of small quantity, or doing one wall. We will measure the area of your property and based on your budget, we will try to give you the best combination of paints that will fit your needs. We call you for an estimate and then we don’t decide to paint? Will I get charged in that case? If you call us for painting a home, office or shop, take our estimate and don’t decide to paint for whatever reason, we won’t charge you. We would have been happy to have provided you with our ideas and estimates so that you can make an informed choice. However we do one visit which is free. Once you get the estimate you will get time to assess and then confirm if you want to hire us. Subsequent visits without your confirmation are not made or would be chargeable. Once I confirm that I will hire you, do I have to pay immediately? Yes. Only a non refundable token amount amounting to 10% of the estimated value. The remaining 60% of the amount is payable on the day the material, labour and equipments arrive at your property. The last 30% to be paid on the day of completion of the job. What if I pay the token amount and then cancel the job? In that case your token amount is non refundable and you will lose it. This is basically done to prevent whimsical confirmations and to cover the costs for the planning work that we would have put into painting your property. However due to some unimaginable situation you defer the painting work, that should be alright with us. You can defer for the duration of validity of the estimate at no extra cost. If you defer the job to a duration outside the scope of the validity of the estimate, then in that case the prevailing rates of that time can be applicable. Once we confirm you then what happens next? We meet again and decide the colour schemes of your property. Then we take a lead time of 4-5 days to arrange the colours of your choice and the required number of painters for the job. Then we ship all the material and send painters to your property on the agreed start day and commence the work. What if I need a job done urgently? Like say I call you today, confirm on the same day and ask you to start the next day? If our painting team is free and the nature of the painting job is simple: Eg paint an empty flat in one colour; then we can do it. However if it is a working space, more colours involved, dependency on other agencies like electricians, carpenters, then we usually take a lead time of 4-5 days. But you are free to ask for a quicker start day. If we can, we certainly will. How will my personal property be protected from paint? On interiors, after you have removed your delicate items, all areas or remaining items, will be covered with clean drop cloths or plastic sheeting. On exteriors, shrubs and surrounding areas will be protected so that no evidence of paint splatter or paint peelings remains. Do I need to move everything from the rooms before you paint? Please move all small items and breakables. Unless agreed otherwise, we will move and protect all of the furniture and fixtures. What is the process of painting? 5)	Application of two even coats of paints. Sometimes with very dark shades, a third coat may be required. How messy or dirty does the painting job get? It depends on various factors again like the kind of existing paint, the furniture in the room, the nature of the room, the kind of paint applied and so on. The maximum mess is creates while sanding the walls before and after putty application. Sanding is done to create a rough surface on which the subsequent coats can bond and to smoothen the putty applied to level the wall imperfections. To minimize the paint and putty particles from falling on the floor, we use mechanized sander machines with vaccum suction to absorb the dust. To prevent your floor/carpets from getting unclean due to the falling particles, we laydown plastic sheets on the floor. Do your painters clean the paint stains after the job? Yes. We will remove all paint stains that may have accidently spilled on your floor, window ledges, glass panes, door knobs. Water based colors get removed with water and scrub ad for oil based coours, paint removers or thinners are used. Can we trust your painters and leave the home to them? Yes. Most people we work for are not home while work is going on. While you are at work or running errands, our crew will be busy painting. We shall provide you with copies of the ID’s of the painters when the work commences. We also provide our painters with a uniform t shirt for easy identification. How long will it take to paint my property? For an empty apartment/Showroom it takes around 4-5 days. For an apartment where people are living, it usually takes longer based on the number of rooms given for work at a time. For bigger commercial spaces, it would entirely depend on the area and working conditions. What hours do your painters work? We generally work from Monday to Saturday from 10:30 am to 6:30 pm. We can do work at other hours if needed, but these are our standard working hours. What if I want to change something about the job or need some additional work done while the painters are already at my home? Please let our office know about it or feel free to contact your estimator directly. Most of the time it is more cost-effective for us to make a change or do additional during the course of the project than to have us come back after the project is complete. How do I maintain my interior painting job? Interior paint typically gets dirty in many situations: hand prints around switches and knobs; splashes in kitchens and bathrooms; marks on hallways and corridors; “soot” accumulating above electric lamps and other heat sources. Removing dirt before it accumulates not only improves appearance, it reduces chances of it getting permanently embedded in the paint film. Check for dirt periodically and assume it will be present in and near cooking areas (airborne cooking oil) and at all places at hand height. Always initially clean the surface with a mild detergent using a sponge or a soft cloth. What is VOC and why do I care? All paints, varnishes, and solvents contain volatile organic compounds, or VOCs. Exposure to VOCs can trigger asthma attacks, respiratory problems, eye irritation, nausea, or dizziness. Because of these health concerns, a number of paint manufacturers have introduced Low or No VOC paint alternatives.